The dishes adorned during some celebrations have become a part of our lunch/dinner menu now. 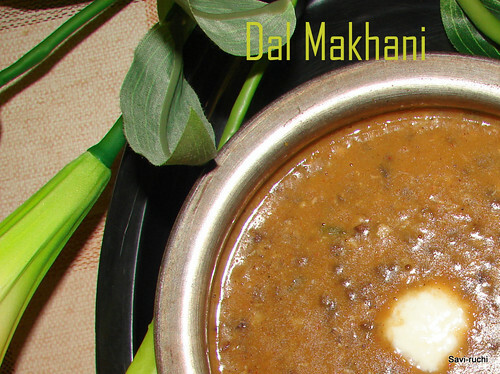 I must say, dal makhani is one such dish. I was not fascinated about this dish, but I feel I have developed the liking for it & now I love this “black lentils cooked on a low heat with loads of butter & spices”. 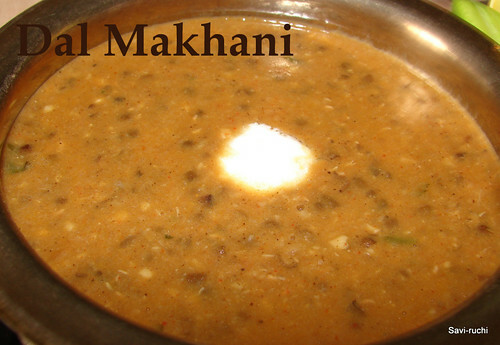 Wash the rajma & black lentils thoroughly & soak them in water overnight or for 8-10hours. Drain completely. Add 4 cups of water, ginger-garlic paste, green chillies to the soaked dals & pressure cook for 4-5 whistles. Keep the heat on medium for the first 2 whistles & reduce the heat for the remaining. Meantime, soak the cashewnuts in milk/water & prepare a smooth paste out of it. Blanch the tomatoes & chop it finely or prepare a puree out of it. Heat oil in a thick bottomed pan, add oil to it. When oil is hot, add garlic & saute till garlic turns golden brown. Add tomato paste or finely chopped tomatoes & cook on a medium flame. Crush the kasoori methi & add it to the pan. Cook until the tomatoes ooze out oil & changes its color. Drain the water from the cooked lentils/dals & mash them gently. Add the savory water, 1/2 cup water, salt & cooked dals to the pan. Add red chilli powder, amchur powder, cashew paste. Cook the dal on a low heat for 20-30mins. (Keep adding 2-3tbsp water if required). Add yogurt, butter, garam masala & cook for another 5 minutes. Garnish it with cilantro & serve hot with rotis/naans or plain parathas. The wait is over. My parents & in-laws landed here last week & all of them are enjoying in their own way. I cooked many new dishes to impress my mom-in-law, but failed in each attempt. As I am not used to cooking for 8 people at a time, I used to always go wrong while adding salt or tamarind. My MIL, being an excellent cook used to find the dishes not that tasty. My mom used to praise me (as expected, she is happy that I'm cooking so many new dishes). I kept on waiting for an opportunity to impress my MIL. She is not that fond of North Indian dishes & I have not yet mastered Udupi(South Canara) cuisine that she loves to eat. I have asked her the authentic recipe for punarpuli rasam & she is cooking the rasam tonite for all of us :) You guys have to wait for my coming posts for the authentic MIL's punarpuli saaru. Slice the eggplants & soak them in water for 15-20minutes. Meantime, mix all the spice powders(amchur powder, chilli powder) including rawa or rice flour & salt. Remove the slices from water & pat them dry. Heat a griddle. When hot, add few drops of oil. Serve it as a side dish for rice or roti. 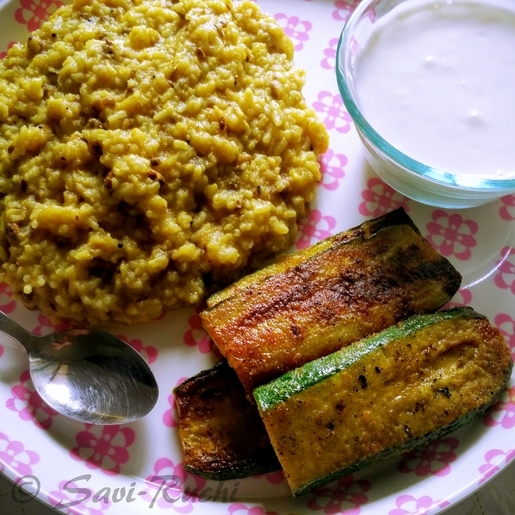 We love to eat our bhaja with khichdi. (Updated on 17th May 2016). Instead of eggplants, you can use zucchini to make spicy roasted zucchini. It tastes awesome. Many of the fellow bloggers are taking a break as few of them are visiting India, others because of their parents' or in-laws visits. I was also thinking about the same, should I take a break or is it sufficient if I'm slow & steady? I personally do not want to take a break. Let us see how time & things make my way to blog during the coming weeks. Now, enough of suspense, I do not want to keep your fingers crossed (really?? Was that a suspense??). My parents & in-laws are coming together for a visit. All 4 of them are landing here this week & I'm all excited !! We are currently settling in our new place (did I mention before that we moved to a new place? ?, if not.., here is that news too .., he he). At office, we also have an important release this month. So many things to do but so little time. I plan to be slow in publishing new recipes, reply to your mails & also, my visit to all the loved blogs would be limited :( There ends my news & task list for the current month. Coming to the bombay saagu recipe. I donot know why it is named so?Please let me know, if you have an answer. I have seen this saagu in most of the food joints along with the very famous rawa idli or sometimes with poori. 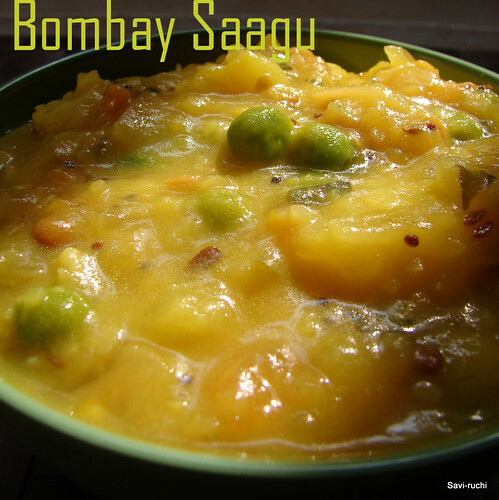 This saagu goes well with anything, be it.., plain rice, chapathi, poori, dosa, idli or roti. Boil & mash the potatoes roughly. Finely chop the onion & tomato. In a broad pan, heat oil. When oil is hot, add mustard seeds, followed by urad dal, channa dal. When dals turn golden brown, add green chilli, curry leaves & saute for 10secs. Add onion & saute till onion turns golden brown. Add tomato & saute till tomatoes are soft & yet firm. Add water & cook the tomatoes till soft. Add mashed potato, turmeric, salt & cook on a slow flame for 2-4mins. Add 4 tbsps water to the gram flour & prepare a paste out of it. Ensure there are no lumps. Add the gram flour paste to the pan & mix it thoroughly. The curry becomes thick in a minute or so. Turn off the heat, add lemon juice & cilantro. Mix & serve with idli, poori, chapathi, dosa or rice. Couple of weeks before, we had to move to a new locality & during the move I decided not to buy any grocery; as moving the grocery along with the other stuffs would be a labor intensive activity. Everyday, when I happened to open the kitchen cabinet, a bag full of black eyed peas used to stare at me. I avoided it for many days as the only thing I used to cook using black eyed peas was huLi(sambar or curry). Finally a day arrived when my kitchen had nothing other than black eyed bean. Stubborn, adamant, anti-social are the right words(according to me; black eyed peas lovers, please dont get offended) for black eyed peas/lobia/alasande kalu. 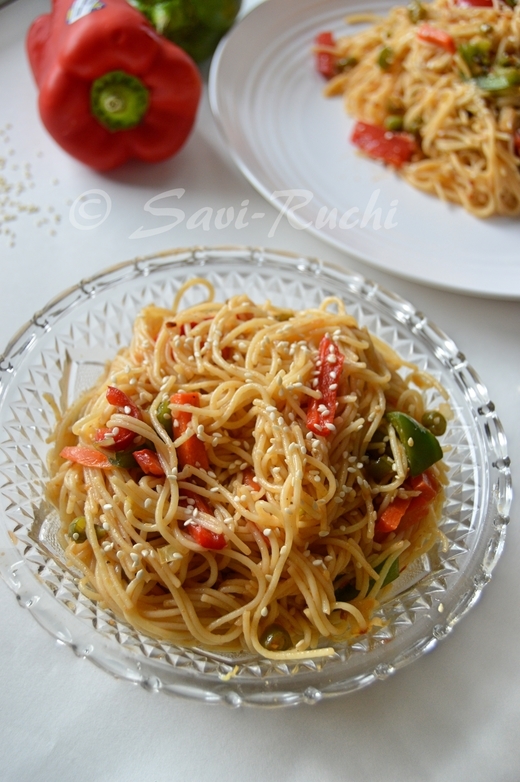 Put in soup, sambar, pasta or in pulao, it stands apart & doesnot absorb the spices easily. 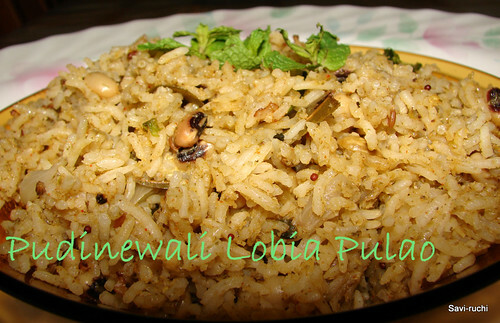 I have seen few fellow bloggers using black eyed peas in pulao. I was little skeptical about the usage of this particular legume/grain as I personally feel that black eyed peas stand apart in most of the dishes it is put in. It doesnot absorb the spices easily unless skillfully cooked.So, I thought of defeating the black eyed beans with some very strong flavored spice/vegetable. The first thing that striked me was " Mint(Pudina)" followed by "Dill (Sabsige Soppu) leaves", "Garlic" & list went on. As mint was handy, I went ahead & prepared the pulao. Mint to a most extent succeeded to defeat the black eyed peas & wore the crown for that day. Three cheers to mint, he he..
Soak the black eyed peas in water for 8-10 hours. Make a smooth paste of mint, cinnamon, cardamom, coconut, poppy seeds, green chilli, ginger, onion by adding sufficient water. Heat a broad pan & add oil to it. When oil is hot, add mustard & cumin seeds. When seeds crackle; add finely chopped onions & saute till onions turn golden brown. Add the masala paste to the pan & fry till the raw smell of masala disappears (around 2-3 mins). Add soaked black eyed peas, 1/2 cup of water & cook on a medium flame until the black eyed beans are almost cooked (it should still be firm & soft). It took a little more than 30 minutes for me to get the black eyed peas cooked. Meantime, wash the rice in running water & soak it for 15-20 mins. Add the remaining water, rice, salt, chilli powder to the same pan & cook it on a medium heat until rice is 90% cooked (Best indicator is : grains would be bigger & little soft. One needs to apply a little pressure between the fingers to press the rice). During this stage, add yogurt, gently mix & cook it covered on a low heat for another 7-10minutes. Open the lid only when you need to serve the pulao. Add lemon juice, gently mix & serve it hot/warm with a raitha of your choice. I would pressure cook the mint sauce with black eyed peas next time when I prepare this dish. 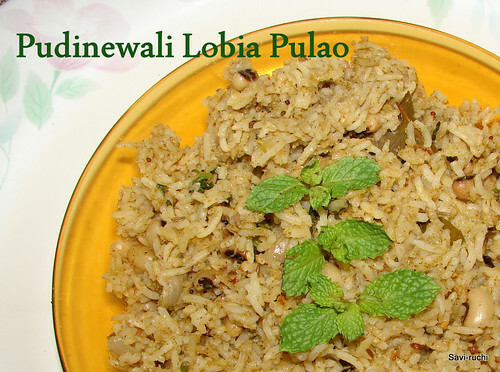 I feel, this would reduce the cooking time of this pulao to a great extent. I have not added garlic in this recipe as I try to avoid it whenever possible. Feel free to use according to your choice. Adding yogurt at the final stage & cooking the pulao on a low heat gives the pulao a slight biryani touch & tastes great. My mom-in-law’s native is a small village near Hebri, Karnataka, India. I feel, she has lived her life as a princess there with 7 brothers & 4 sisters. Yes, you read it right; my hubby’s maternal grandparents had 12 children. That village belongs to the Kudremukh National Park & is amazingly beautiful. Their house is a small palace with greenery & stream surrounding it. 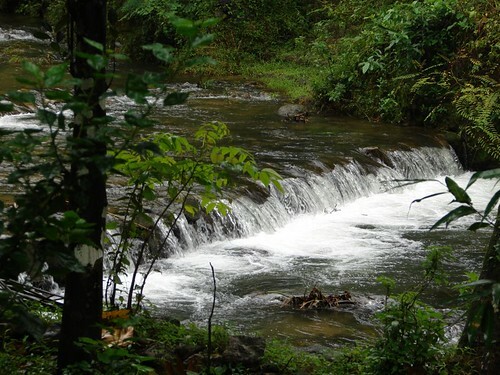 One can hear the water flowing in the stream while cooking in the kitchen, isn’t that bliss? Here is the view of the stream from kitchen. 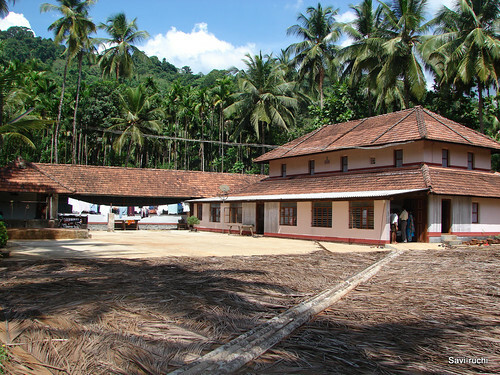 This is the land that introduced me to a lot of herbs/vegetables like Brahmi, Punarpuli, Vaatehuli etc. I am a crazy fan of Brahmi(popularly known as Gotu Kola) since then. I keep exploring for more & more Brahmi dishes. This herb never disappoints me in whatever dish I put it in. I have used this to garnish my stir-fry too. Coming to this brahmi recipe, this recipe is from my friend. She passed this recipe during one of our usual chatting sessions, however I have made some changes to it (as expected, my hands start itching if I don’t make modifications to the original). Brahmi leaves: 2 cups (I used 6 cubes of frozen Brahmi). Wash the brahmi leaves & pat them dry. Heat oil in a broad pan, when oil is hot, add udal dal, when urad dal turns golden brown, add red chillies & fry for 20-30secs. Follow, red chillies by brahmi leaves & saute until soft (becomes dark green). 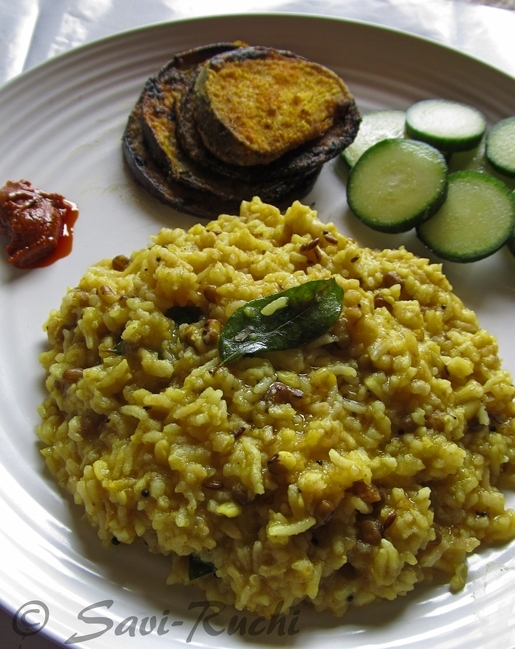 Heat oil in a pan, when oil is hot, add mustard seeds, followed by curry leaves & asafetida. Then add the paste prepared & saute till all water is absorbed (3-5 minutes). Allow the chutney to cool & this can be stored in the refrigirator for 3-5 days. Goes well with curd rice, akki rotti & dosas. 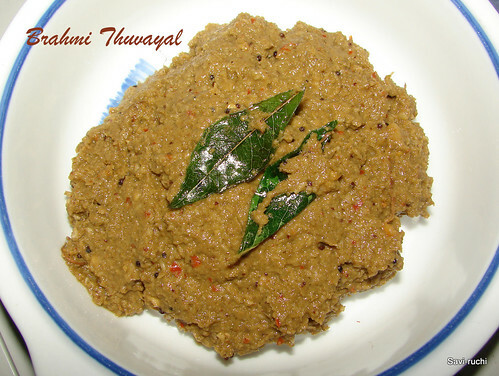 This thuvayal & brahmi tambli goes to "SWC: Cooking with Greens" hosted by Sowmya of Creative Saga & to Lakshmi who is the creator of the event.